Follow-up to "Kinetic Flow". Ethereal, almost flutey wordless sighs get "Rain Shadow (transparent mix)' underway. Its all very effective but also a rather misleading way to start an album which goes on to show that Rudy is now really beginning to 'feel' what is necessary to produce a first rate sequencer album. At around three minutes the first sequence enters, it is a rapid one with a great deal of depth- something to really get your teeth into. I just wish it could have gone on a little longer. The title track comes next. Breathy then rather metallic pads act as a backdrop to a gorgeous tinkling sequence which is underpinned by a bass one. The lead line is spot on with a distinctly 70s feel to it. The track just gets better and better and another sequence and lead line are chucked in. Things don't get out of control however instead maintaining a subtle beauty. 'Our Favourite Robot' begins with Tangerine Dreamish early to mid 70s atmospherics but these are quickly dispersed by a chugging sequence over which play relaxing melodic touches, providing detail rather than the main force of the track which is still the job of the swirling sequence. Again I wish it could have gone on longer. 'Song of the North- Kinetic Flow Revisited' is a re-working of the track 'Kinetic Flow' from the album of the same name and to these ears is far superior. After a relaxed melodic start we get twittering atmospherics and slightly Eastern sounding piano color (very low in the mix). The sequence enters in the fifth minute and soon takes center stage, pads swelling and swirling around it. It increases in intensity and complexity until at the eight minute mark it is really starting to rock, an electric guitar sounding lead line adding to the power. This would be great to listen to whilst driving far too fast. 'Luchtkastelen ('Castles in the Air)' makes use of suitably 'airy' atmospherics. Its all rather metallic sounding, as if the wind is blowing through old air conditioning pipes. 'Reflections on Blue' is again atmospheric but this time the pads are much deeper. The images created now are of being under the water. The main melody is very tranquil but also full of wonder, like watching some huge whale gently float past. At the three minute mark two sequences start upon each end of the sonic spectrum as if a storm was disturbing the peaceful setting and this mood continues until the end of the track. 'A Postcard from Karnak' finishes the album off peacefully but with something of a dark edge to it. This is atmospheric music with attitude. 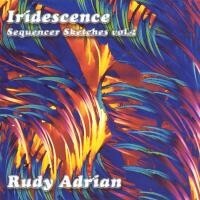 DL Hailing from New Zealand, Rudy Adrian delivers 53 minutes of ambient electronic music with this 2001 CD (a follow-up to his very popular "Kinetic Flow" release). Fusing Berlin School sentiments with modern technology, Adrian produces a lush trance that is peppered with sequenced liveliness. Although the music is highly rhythmic, hardly any E-perc is utilized, tempos being comprised of applied surges and cyclic keyboard riffs. Adrian's style blends rapid sequencing with languid ambience, injecting power and grandeur to what is normally considered a background presence. The result is peppy electronic music that exudes an atmospheric quality. At nearly 17 minutes, "Song of the North" is the CD's longest piece. It starts with a traditional-sounding Vangelis-esque synthesizer intro that soon gives way to a delicate fairie-land soundtrack of twinkling notes and crystalline chords, evoking a chilly but pleasant soundscape. Denser sequencing gradually slides into the mix, lending the flow muscle and a more predominate melody. Soon, these textures explode with fanciful velocity and vibrant force, filling the icy sonic sky with cavorting spirits of an inspiring nature. The compositions display a fusion of energetic passages undulating against a curtain of glimmering sonic softness. These tracks create a rich feeling of aerial passage through regions of sparkling light. While disdaining overtly demonstrative expressions of volume, Adrian achieves a majestic command of the listener's attention through engaging melodies laced in drifting structures. Some of you musicians should be held responsible and accountable for me being so thin and frail! 2004. Frank Arellano It's hard not to have a good time listening to Iridescence. Rudy Adrian's fresh insight into the Berlin School of electronic music combines his sensual memory of the natural world with suprising shapes of glowing analogue sound. Coaxing classic warm timbres from his synthesizer, Rudy Adrian transmits the most cosmic of ideas with instinctual accuracy. Syncopated synth patterns beneath confident lead melodies rise out of vast cerebral preludes and provides each piece with its own unique contour. Detuned drones, shifting pads and elated harmonies give Iridescence an introspective quality and vivid dimensionality while the album's rhythmical cadence and lilting melodies provide a bright and lively focus.